Whether you’re looking to add plant life to your aquarium for decoration, filtration or as a haven for your fish, the types of plants you bring into your tank are important! Plants require nearly as much care as fish. What you’ll find here is the best low lighting aquarium plants for beginners or experienced aquarium enthusiasts. All of the above factors can play a role in deciding if it’s the right plant for your tank! So how do you find what’s best for you? Low lighting plants are a great place to start, typically because they don’t require a lot of additional effort on your part. They offer many benefits in aquarium design and there is a large variety. 1. Are there any plants that beginners should avoid? 3. What are root tabs and do I need them? 4. What is liquid fertilizer? There are four regions to take into consideration when designing your planted aquarium. If you already have fish in your tank and a stable ecosystem these areas can help you determine which plants are best for you and your tank! These are the upfront and in your face plants. Usually, aquarium enthusiasts chose low laying or less dense plant life for the foreground. Common choices are sparse and low growing leafy plants like Cryptocoryne. Another popular choice is the individual branch option, like the Japanese Rush. The middle section of your tank’s ground is where most of the attention falls when your tank is viewed. This is where a delicate balance is established visually, but it plays another important role. Mid-ground plant life can interfere or inhibit your fish’s swimming area. Avoid choosing too many high-growing or overly dense plants in the mid-ground section. This can limit the swimming area and make your tank look crowded. The furthest back section of the tank is a prime spot for clinging, climbing, and tall growing plant life. In low lighting aquariums, the back section is often filled with mosses and dense low-maintenance plants. Java Ferns are a favorite, and nearly a staple, in the background of most aquariums. Floating plants sit on the surface and often have root systems that dangle into the swimming area. Some floating plants, however, start out in the substrate with the rooted plants and during flowering periods will reach the surface level. Many aquarium enthusiasts, beginners especially, find that they are more concerned with some of the big picture aspects with plants. How they look can drastically change the landscape of your tank, for you and your fish! Rooted or rooting plants often keep the look of your tank focused on the fish. Where surface plants can leave dangling root systems that dredge through your fish’s swimming space, rooted plants don’t. Most often, beginners turn to rooted plants because they are typically easy to maintain, look natural and offer great areas for fish to hide. The most common types of design for an experienced planted aquarium enthusiast are a biotope. This means that you’re attempting to replicate a natural habitat. One example is using jungle plants with tropical fish for a full effect. However, this can be difficult and for many beginners isn’t feasible. A biotope may require many plants with varying needs of maintenance even if they do grow well in low lighting. On the other hand, choosing to mix and match plants allows you to determine how much time you’ll put into maintenance and your spending. 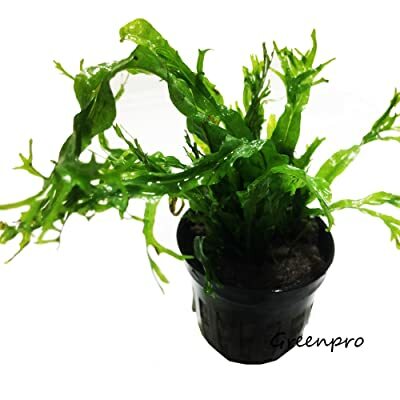 Crypt Wendtii is one of the most commonly seen aquatic plants in home aquariums. They are easily placed in any space in the tank and contribute to a bright green landscape. These types of aquarium plants are very beneficial for fish like cichlids and loaches. Although these types of fish are known for digging, these plants are hardy and difficult to uproot from the substrate. Crypts are easily identified by their wavy, long, bright green leaves. Sister to the Crypt Wendtii, Crypt Spiralis, has characteristically ruffled leaves. The leaves grown in tight clusters from the roots which make for great hiding spots too! Overall crypts are chosen for their visual appeal and low maintenance. Their bright colors and wavy leaves give them a distinction from other plants that can sit in the foreground. You can also use them in the mid-ground or background to help fill in holes in your landscaping. A plant that loves its low lighting is the Java Fern. Although it tends to grow very quickly in increased lighting, you’ll appreciate not having to maintain this fern all the time. The low lighting slows its growth just enough for easy maintenance and long-term health. 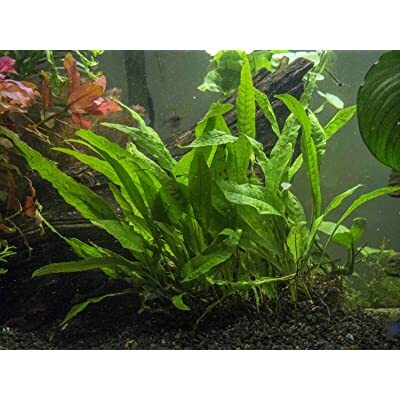 The Java Fern fits in with the design of nearly any tank really well because of its vibrancy and wide leaves. Its wider leaves are great for filling in gaps and can fluff a background considerably without the added bulk of many leaves. 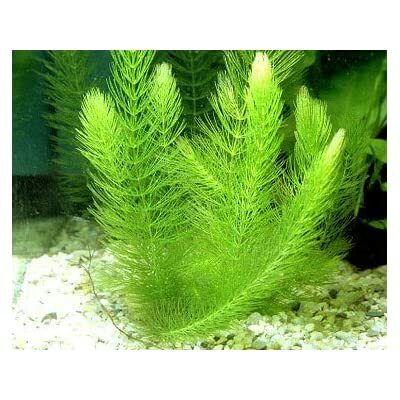 The technical name for the very popular Java Moss is Vesicularia Dubyana. 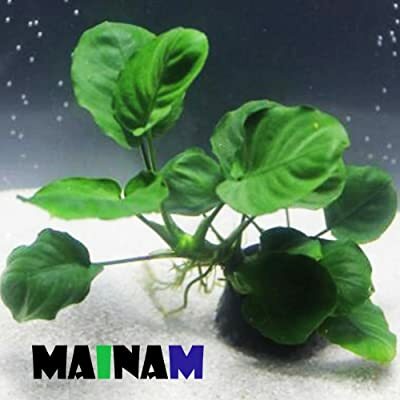 It is one of the lowest maintenance, low demanding of light plants you can have in your aquarium. This moss clings to nearly anything and will wrap beautifully around wood, or aquarium decorations. Use Java Moss to liven up your tank with deep green foliage that is dense and grows in compact areas. 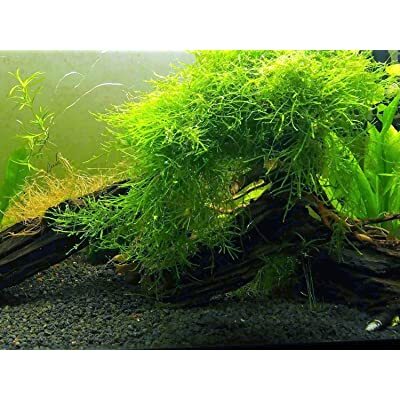 Java Moss is also a favorite and highly recommended, for beginners. This is because the tank itself adapts to the moss easily. Eventually, it will become more difficult to kill than to simply keep it alive. One of the things that drive many aquarium enthusiasts away from planted tanks is the possible effects on your fish. The fluctuation in carbon dioxide levels, changes in bacteria, and a possible increase in maintenance seems like a lot of hard work for some plants. A jungle plant, this is great if you have any tropical fish you want to highlight. The range of green in the leaves and dense growth gives great mid-ground coverage while leaving tons of swimming space for your fish! Anubias grows well in low lighting and in varying water levels. It attaches itself to wood and aquarium decorations. But, because it grows so well and climbs over wood and decorations, it does need regular trimming. This plant life becomes bushy very quickly, however, works well in maintaining carbon dioxide and biological components in the tank. An overarching type of grass, an aquatic plant that is most commonly referred to as Katniss. This plant grows in very bright green, thin leaves. Although the leaves are very tall, they curl over and sway easily making them a prime choice for planting in the foreground or mid-ground regions of the tank. 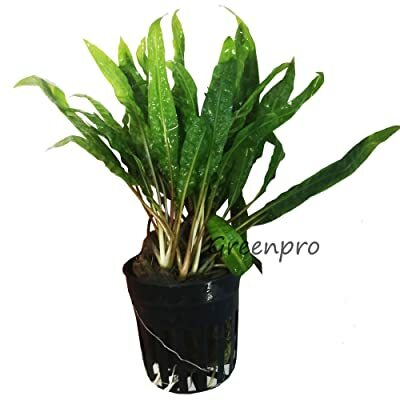 Be sure if you are purchasing Sagittaria that you are choosing young and vibrant plants. The low lighting will delay their growth a bit but that also means that any clipping or trimming is done less often as well! Unlike the standard Java Fern, the Windelov is far denser and have a distinctive splitting pattern down its edges. This fern thrives in low lighting and is bushier than other ferns. Use this in the mid-ground to give you fish a great hiding space. Many fish will also try to use a thick fern such as the Windelov as a breeding ground or to hide their egg clutches. Windelov Java Ferns are also a great option for hiding if you have known predators in your tank. The plants listed here don’t require a lot of extra attention or chemicals to work into your aquarium’s budget. Many beginners are deterred by the expense that can come with a planted aquarium. But, plants don’t have to be expensive! An extremely versatile plant that isn’t rooted, but instead either clings or floats. You can attach it to a bit of decoration or wood to anchor it to the bottom in either a tropical or cold water tank. Hornwort grows tall and thin but gives a lot of cover for small or newly hatched fish. Be careful with Hornwort as it does multiple on its own! Eventually, a bit of it will break off and begin to grow as a new plant on its own. Hornwort is one of those plants that are distinctively hard to kill. 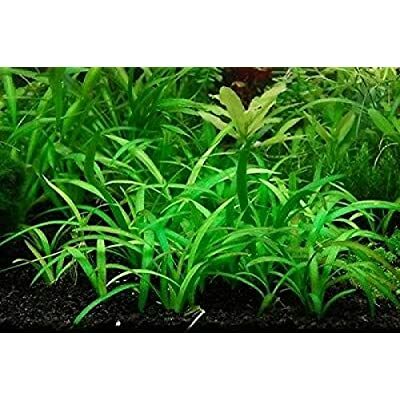 These grass plants grow fast enough to cover the entire background of your aquarium even in low lighting. They use runners to fill upwards and grow in thick masses which helps cover the flooring of the background also. 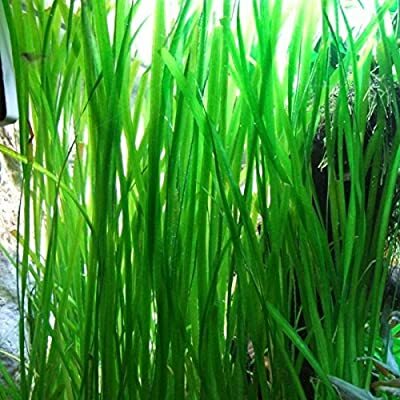 Vallisneria’s or often called “Vals” are jungle aquatic plants that can grow exceptionally tall. Be sure to clip back any traditional Vallisneria or, if you don’t want so much maintenance, go for a “Corkscrew Val” which appears to grow slower because of how their leaves spiral. Yes! Beginners should avoid red and purple plants because of both their lighting and maintenance needs. It can be difficult to resist the allure of bringing a greater variety of colors into your tank but wait until you have the time and know-how! Beginners should also avoid purchasing low-quality plants. This seems to go without saying but, it’s hard to tell at first. Always buy plants that are young, or look more like sprigs than plants and are in containers. Bad quality plants or even non-aquatic plants are often seen in tubes, or they are kept in extremely low water but advertise they do just fine in a full tank. Similarly, check out the plants coloring. Many aquatic plants are very vibrant. Any yellowing leaf tips or dull deep greens should be avoided. Fluorite is a substrate that you add to the gravel in your tank. It provides an increase in iron that many aquatic plants need. However, most of the plants on this list do not need fluorite or any other additive to survive happily. You can add it to crypts or Vals to increase the plants flourishing and nutrients but it isn’t necessary. The short answer is, sometimes. Just like fluorite, they can help your plants health but not using them does not mean your plant is going to die. Many aquarium owners opt for root tabs over fluorite because they usually last for a few months rather than having to maintain another chemical level. Again, with the plants in this article, you shouldn’t need any root tabs or fluorite. If you have non-rooted plants, like Hornwort, you plant could benefit from a liquid fertilizer. Essentially, this is a liquid dose of necessary nutrients for the plants that float on the surface or cling to decorations. Since these plants aren’t rooted they don’t have the opportunity to grab nutrients from the biological materials in the gravel. This liquid shouldn’t have any great effect on your other chemicals and in small aquariums a little goes a long way! These four all thrive in low lighting and offer a wide range of greens colors, heights, and textures. Additionally, most of them require low or no maintenance which makes them a premier choice for beginners as well as seasoned aquarium enthusiasts. Low lighting can severely affect plants. Choosing the best low lighting aquarium plants for your tank doesn’t have to be a difficult decision though. Use a design that works for you and your fish with plants that are sturdy and low maintenance!